This stainless steel manicure and pedicure tool combines our famous Pushy cuticle pusher at one end and with a convenient nail cleaner at the other end. Edges are buffed smooth to prevent catching the nail. Its textured body provides a secure grip. 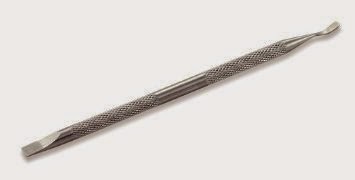 I am currently in the process of growing out my nails, and I have been wanting to find a good cuticle pusher that would help me keep my nails looking great, and improve the appearance of manicures. I have used plastic and wood cuticle pushers in the past, but I never really got the results I wanted. This cuticle pusher by Majestic Bombay was the very first stainless steel one that I have ever used, and I love it! Using this is simple. Use the pusher side to push back your cuticles. Use the opposite end to clean under and around your nails. I love that this is made from stainless steel, it gives me great results. The problem I had with wooden cuticle pushers was that they would last for maybe 4 uses before they were pretty much ready to be thrown away. Thus I'd have to keep buying more. With this one being made from stainless steel, I save money because I can keep reusing it over and over. It doesn't lose its form, or fall apart. Overall I am just happy with it!